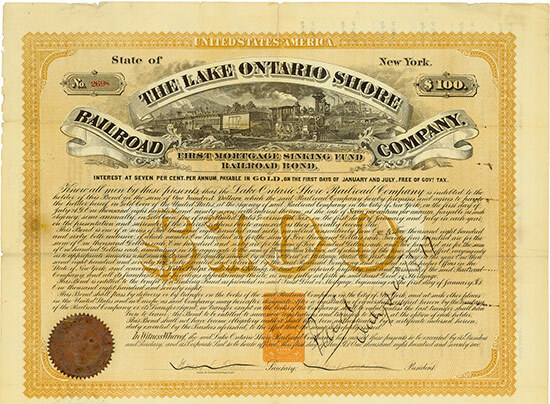 State of New York, 01.05.1872, 7 % First Mortgage Sinking Fund Railroad Gold Bond über US-$ 100, #2698, 31,5 x 43 cm, braun, schwarz, Knickfalten, Randeinrisse, kleines Loch rückseitig überklebt, schriftentwertet, 44 Restkupons, gigantische, große, hochdekorative und aufwändig gestaltete Stahlstichvignette mit Zug, gedruckt bei Charles M. Cornwell, Revenue Imprint RN-S1 (Mitte, Scott US-$ 3.750, leicht von der Schriftentwertung betroffen), nur drei weitere Exemplare (#2708, #2775, #2776) sind bei Cox gelistet, US-Railroad-Bond der Superlative aus der Sammlung Tankred Menzel! State of New York, 1 May 1872, 7 % First Mortgage Sinking Fund Railroad Gold Bond for US-$ 100, #2698, 31.5 x 43 cm, brown, black, folds, tears, minor junction fold hole repaired with tape on the back, pen cancelled, 44 coupons remaining, superb, large steel engraving vignette with train, printed at Charles M. Cornwell, Revenue Imprint RN-S1 (centre, Scott US-$ 3,750, lightly affected by a single pen stroke), only three more copies (#2708, #2775, #2776) listed in Cox, Premium Railroad Bond from the collection of Tankred Menzel! Die Strecke der 142 Meilen langen Eisenbahn verlief entlang des Lake Ontario (New York) von Oswego nach Lewiston am Niagara River. Später ging die Bahn in der Rome, Watertown & Ogdensburgh Railroad auf. The railway was 142 miles long and led along the Lake Ontario (New York) from Oswego to Lewiston at the Niagara River. Later the railway was taken over by the Rome, Watertown & Ogdensburgh Railroad.